Dillenia indica fruit is known for its numerous health benefits in folk medicine including its use to cure kidney diseases. The present study was designed to investigate the protective effect of D. indica fruit extracts on cisplatin-induced nephrotoxicity. A nephrotoxic dose of cisplatin (3 mg/kg b.w./day, i.p) was administered every fifth day to the animals receiving vehicle or fruit extracts (methanol, ethyl acetate, and petroleum ether) daily for 25 days. Rats were sacrificed on the 25th day, and the effect of extracts was assessed by determining the alterations in various serum and urine parameters, membrane-bound enzyme, and antioxidant defense system in kidney tissue. Increase in serum urea, uric acid, creatinine, blood urea nitrogen, phospholipid, and cholesterol and a decrease in urine urea, uric acid, creatinine, and creatinine clearance rate were reported in the cisplatin control group. Cisplatin alters electrolyte balance, brush border membrane marker enzyme (i.e., alkaline phosphatase, γ-glutamyl transferase, leucine aminopeptidase) activity, and redox balance significantly. Methanol and ethyl acetate extracts of D. indica fruit produced beneficial effect and ameliorated serum and urine parameter to normal. Extract administration increases Na+/K+-ATPase activity and different enzymatic and non-enzymatic antioxidants positively, whereas lipid peroxidation reduced significantly. Extracts exhibited a potent in vitro antioxidant activity. Taking into account these results, it can be assumed that D. indica fruit could be the future key candidate which may maximize the clinical use of cisplatin in the treatment of different cancer without nephrotoxicity. The incidence of drug-induced nephrotoxicity has been increasing at a frightening rate with the increasing uses of antibiotics and anticancer drugs . Oxidative stress is considered as a key factor for drug-induced nephrotoxicity . Cisplatin [cis-diamminedichloroplatinum (II)] is the most common and potent anticancer drug used against a diverse spectrum of malignancies. However, the use of cisplatin in combating cancer is limited due to frequent reversible and irreversible side effects like nephrotoxicity, neurotoxicity, bone marrow toxicity, and gastrointestinal toxicity and ototoxicity . Dillenia indica Linn. (Family: Dilleniaceae) is a wildly available medicinal plant found in Northeast India. The common name of the plant is outenga in Assamese and chalita in Bengali. The plant grows in abundance in this part of India, but most of the fruits of this plant are wasted due to the lack of technical knowledge. Fruits are edible; the fleshy calyx of the fruit can be consumed directly and also be prepared with vegetable and pickle. The fruits and other parts of the plant are used traditionally to cure a number of ailments like stomach problem, fevers, and cough and to combat hair fall and dandruff . The juice of the fruit was used by the folk medicinal practitioners of Bangladesh to cure kidney diseases . The previous investigation found that D. indica fruits contain ascorbic acid, tocopherol, carotene, and phenolic compounds . The fruits of D. indica found to possess several beneficial functions such as anticancer and antidiarrheal , antioxidant , CNS depressant, and anti-inflammatory activity . Food with antioxidant potential or antioxidant molecules such as phenolic acids, flavonoids, and tannins particularly from plant sources have proved their potential role as a prophylactic or curative agent against various oxidative stress-related diseases . The present study was undertaken to evaluate the protective activity of D. indica fruits against cisplatin-induced nephrotoxicity. Fruits of Dillenia indica Linn. were collected from the state of Tripura, India, and authenticated by Dr. BK Datta, Department of Botany, Tripura University, Tripura, India (voucher specimen no. TU/BOT/HEB/RC25092011a). The fruits were cleaned to remove unwanted material and cut into small pieces. The fruits (without seed) were dried under the shed as required to grind into coarse powder. The powder of D. indica fruit was extracted with methanol, ethyl acetate, and petroleum ether separately using Soxhlet apparatus. The filtrate was concentrated, and the solvent was evaporated under reduced pressure to obtain methanol extract (DIME), ethyl acetate extract (DIEE), and petroleum ether extract (DIPE) of D. indica fruit. Healthy albino female mice were used for acute toxicity study, and male Wistar rats were used for the nephroprotective activity. Animals were maintained under standard environmental conditions. The animal experiments were carried out according to the guidelines of Committee for Purpose of Control and Supervision of Experiments on Animals (CPCSEA), Ministry of Environment and Forests, Government of India. The study was approved by the Institutional Animal Ethical Committee (Reg. No. 1305/ac/09/CPCSEA). The free radical scavenging activity of extracts of D. indica fruits was determined by 2,2-diphenyl-1-picrylhydrazyl radical (DPPH●) scavenging assay method , nitric oxide radical (NO●) scavenging assay method , and lipid peroxidation inhibition assay . Ascorbic acid and rutin were used as standard in DPPH●, NO● scavenging, and lipid peroxidation inhibition assay, respectively. In this study, we adopted acute oral toxicity-acute toxic class method as per OECD guideline 423 (Annexure 4d). This method is considered reproducible, required a very limited number of animals, and is able to categorized substances in a parallel mode to the other acute toxicity study methods like OECD guidelines 420 and 425. The extract (2000 mg/kg) is administered orally to three healthy nulliparous and non-pregnant female albino mice (20–25 g). Mice were observed individually at least once in half an hour during the first 24 h, with special notice given during the initial 4 h, and daily thereafter, for a total of 14 days [11, 12]. Healthy animals were acclimatized to the standard laboratory facility for a week. Rats were fed with standard rat chow and water ad libitum under controlled conditions. Treatment schedule and induction of nephrotoxicity using cisplatin was performed as per the procedure described by Khan et al. . At the end of acclimatization, period animals were divided into major four groups (control, DIME, DIEE, DIPE) each containing 12 animals. Animals in different major groups were treated with water (control), DIME (300 mg/kg/day, p.o. ), DIEE (300 mg/kg/day, p.o. ), and DIPE (300 mg/kg/day, p.o.) for 5 days. Animals of each major group were divided into two subgroups each (six animals/subgroup) and continued to receive their extract treatment daily at a dose of 300 mg/kg orally. Based on preliminary study, 300 mg/kg dose was selected. Cisplatin (CP, 3 mg/kg b.w./day, i.p) in 0.9% saline is injected every fifth day (four injections in total) for 25 days to induce nephrotoxicity to one of the subgroups designated as CP-control, CP-DIME, CP-DIEE, and CP-DIPE. Normal saline in equivalent volume was given to the animals of the other subgroup from each group for the same period. The rats were sacrificed on the 25th day, 5 days after the last injection of cisplatin under light ether anesthesia (Fig. 1, grouping of animal and treatment schedule). On the 25th day, urine samples (24 h) were collected using metabolic cages. Blood samples were collected by cardiac puncture under light ether anesthesia, and serum sample was used for estimation of different biochemical parameters. After euthanasia, one kidney of each rat was rapidly removed and washed thoroughly with ice-cold normal saline, and homogenates (10% w/v) were prepared 0.1 M Tris-HCl buffer, pH 7.5. The homogenate was centrifuged at 3000×g for 15 min to remove the cell debris. The supernatant was used for the determination of different biochemical parameters. Blood urea nitrogen (BUN) and cholesterol level in serum were determined by commercially available kits. Phospholipid content in serum was estimated using a standard method . Potassium and sodium level in plasma was estimated using flame photometer. Level of Na+/K+-ATPase and brush border membrane marker enzymes like alkaline phosphatase (ALP), γ-glutamyl transferase (GGTase), and leucine aminopeptidase (LAP) was assayed by previously described method [15, 16]. Superoxide dismutase (SOD) activity was estimated by the inhibition of formation of autocatalyzed adrenochrome in the presence of tissue homogenate at 480 nm. Catalase (CAT) activity was determined by the method adopted by Asokkumar et al. in which decomposition of hydrogen peroxide (H2O2) in the presence of CAT was measured at 254 nm. Glutathione reductase (GR) activity was determined by the method involving oxidation of NADPH into NADP+ in the presence of oxidized glutathione. Glutathione peroxidase (GPx) activity was estimated by monitoring the oxidation of reduced NADPH at 340 nm. The level of reduced glutathione (GSH) was determined using the method of Asokkumar et al. . Total malondialdehyde (MDA) was determined as an index of the extent of lipid peroxidation in kidney tissue using standard method . The results are expressed as mean ± S.E.M (n = 6 for in vivo test and n = 3 for in vitro study) Statistical difference was tested by using one-way analysis of variance followed by Tukey tests. A level of p < 0.05 was used as the criterion for statistical significance. In principle, the acute toxicity study method is not intended to permit precise LD50 calculation but used to find exposure ranges to check lethality since the death of a proportion of experimental animals is still the main endpoint of the test. In acute toxicity study of samples, mortality was not observed at the dose of 2000 mg/kg; thus, further lower dose is not administered. Considering OECD guideline, 2000 mg/kg dose was categorized under Globally Harmonized Classification System (GHS) category 5 (safe dose), as per OECD guideline 423 (Annexure 2d). In vitro antioxidant activity of different extracts of D. indica fruit was investigated. Our present findings showed that DIEE and DIME exhibited strong free radical scavenging activity. The IC50 values of DIEE (15.8 ± 0.02 μg/ml) and DIME (29.3 ± 0.03 μg/ml) against DPPH• were observed while IC50 values of DIME (28.22 ± 0.34 μg/ml) and DIEE (34.0 ± 0.55 μg/ml) against NO• and the IC50 values of DIME (61.5 ± 0.60 μg/ml) and DIEE (70.7 ± 0.54 μg/ml) against lipid peroxidation inhibition assay (Table 1). Effects of D. indica fruit extracts on serum and urine level of urea, uric acid, and creatinine were tabulated in Table 2. Treatment with cisplatin causes a significant rise in serum urea, serum uric acid, and serum creatinine level, whereas the level of urea, uric acid, and creatinine in urine significantly reduced in the cisplatin control group. Treatment with DIME in the nephrotoxic group (CP-DIME) cause significant reduction in serum urea (− 32.2%), serum uric acid (− 46.0%), and serum creatinine (− 37.1%) level and an increase in urine urea (+ 14.8%), urine uric acid (+ 37.4%), and urine creatinine level (+ 39.6%). Results showed that DIEE also produced a significant nephroprotective effect on cisplatin-induced nephrotoxicity. None of the extracts produces any significant variation in serum and urine parameters when administered in healthy animals. Cisplatin also induces 18.5% reduction in creatinine clearance rate when compared with the control. DIME and DIEE treatment significantly elevate creatinine clearance rate in nephrotoxic animals. The administration of cisplatin to healthy rats caused a significant increase in BUN (+ 89.6%), serum phospholipid (+ 25.8%), and cholesterol (+ 34.2%) level. The extracts had no effect on these parameters when administered on healthy animals. Although, DIME and DIEE (300 mg/kg) when administered in rats that received cisplatin significantly prevent such alteration and reduce BUN, serum phospholipid, and cholesterol level compared to the nephrotoxic group (Table 3). There was only a small insignificant decrease in serum sodium level (− 5.2%) and a significant decrease in serum potassium level (− 40.2%) in the cisplatin-treated group in comparison to the normal control group. DIME and DIEE administered at a dose of 300 mg/kg along with cisplatin have shown significant (p < 0.01) decrease in the serum potassium level in comparison to the cisplatin control group. Both urinary excretion of sodium (+ 118.7%) and potassium (+ 62.7%) was increased significantly after cisplatin administration. Administration of DIME in nephrotoxic animals caused 39.6 and 35.9% reduction in urinary sodium and potassium excretion, respectively. DIEE reduced excretion of urinary sodium and potassium significantly, though DIPE had an insignificant effect on administered in the nephrotoxic group (Table 3). A significant reduction in the activities of Na+/K+-ATPase, ALP, GGTase, and LAP was observed after cisplatin treatment. DIME and DIEA treatment in animals that also received cisplatin increased Na+/K+-ATPase by 50 and 37%, ALP by 44 and 28%, GGTase by 59 and 49%, and LAP by 45 and 34%, respectively, compared to the CP-control group. Result reviled that marker enzyme activity was restored after the administration of DIME and DIEA, which further indicated toward the protective effect of D. indica fruit (Fig. 2). The effect of DIME, DIEE, and DIPE was determined on the level of various enzymatic and non-enzymatic antioxidants when administered in nephrotoxic and healthy rats (Table 4). Level of SOD, CAT, GPx, GR, and GSH significantly reduced after cisplatin induction, whereas the level of MDA increases. Cisplatin-induced reduction in antioxidant activity was inhibited significantly after the administration of DIME and DIEE. After receiving the respective drug treatment in nephrotoxic animals, there is a significant change in the level of MDA (− 63.3% by DIME, − 54.1% by DIEE, − 24.7% by DIPE) compared to the CP-control group. Cisplatin is a most widely used drug for the treatment of different cancers and solid tumors. However, nephrotoxicity caused by the drug is a main limiting factor of its widespread clinical use for the long-term treatment . A number of investigations have been carried out to find/monitor the protective effect of different natural substances like grape seed extract, fish oil , green tea , Momordica dioica fruit , Ganoderma lucidum, a mushroom , etc. when administered along with cisplatin; however, their use in clinical practice could not be achieved till now. Fruits of D. indica are commonly used as a vegetable, and an ethnomedicinal survey conducted in Bangladesh showed that D. indica fruit juice was used by the patients with kidney problems . Oxidative stress is an emergent factor for the causation of many diseases, and nephrotoxicity is one of them. Antioxidant molecules present in the plant/food can act synergistically along with exogenous antioxidants to avert oxidative stress-induced damage . In vitro study reveals that D. indica extracts particularly methanol and ethyl acetate extract possess strong in vitro antioxidant activity tested through lipid peroxidation inhibition assay, DPPH radical, and nitric oxide radical scavenging activity. These results are similar to that of previous investigations carried out by different researchers [5, 21, 22]. Inhibition of lipid peroxidation by extracts further expands their role as a potent antioxidant. Repeated injection of cisplatin was found to induce marked renal dysfunction as evidenced by increased serum urea, uric acid, and creatinine diagnostic indicators of nephrotoxicity. Urea is the key nitrogen-containing metabolic product produced during protein metabolism . Uric acid is considered as the last substance produced from an exogenous pool of purines and endogenous purine metabolism . Creatinine is a breakdown product of creatine phosphate in muscle, is generally formed at a fairly constant rate based on muscle mass, and considered as a measure of kidney function . The serum urea, creatinine, and uric acid may induce the alteration of the glomerular filtration rate, and increase in their levels in serum is linked with renal damage and considered as the indicator of nephrotoxicity. Increased level of urea concentrations in serum may increase after parenchymal injury. Hyperuricemia is considered as a renal prognostic factor, which may indicate the physical response to an amplified generation of endogenous oxygen species as uric acid scavenges peroxynitrite [23, 26]. Serum creatinine concentration is considered as a potent indicator of the first phase of any kidney disease than the urea and uric acid levels . The most penetrable organ in a living system is the kidney through which the toxic substances are eliminated from the living system. Urinalysis is a major pathway to define whether kidney is functioning properly . Cisplatin causes decrease in the level of urine creatinine, urea, uric acid, and creatinine clearance. These changes may occur due to the reduction in the glomerular filtration rate (GFR) or may be secondary due to the oxidative stress, which can cause contraction of mesangial cells, alteration of filtration surface area, and modification of the ultrafiltration coefficient factors that thereby reduces GFR . In the present study, administration of DIME and DIEE positively ameliorated the serum and urine level of urea, uric acid, and creatinine levels in all the rats treated with cisplatin. Creatinine clearance rate was also increased after the extract administration. The results indicated the protective effect of DIME and DIEE against cisplatin-induced nephrotoxicity. The BUN is considered as an indicator of renal function. Cisplatin induces the destruction of proximal and distal tubules preceded the renal hemodynamics, reduced the reabsorption, enhanced vascular resistance, and caused an elevation in the level of BUN . Cisplatin administration increases BUN level significantly, which was back to normal after DIME and DIEE administration. There was a significant (p < 0.001) increase in the levels of serum phospholipids of nephrotoxic animals compared to healthy animals, which is in line with earlier reported studies . The cellular injury is linked with the alterations in lipid composition of tissue . Hence, the elevation in the level of serum phospholipids in the CP-control group may due to the damage of membrane phospholipids caused by cisplatin. Serum cholesterol profoundly enhanced upon cisplatin treatment. The phospholipids are vital membrane components, and a significant decrease in the serum phospholipid and reduction in serum cholesterol level by DIME and DIEE in animals of the CP-DIME and CP-DIEE group may link with the beneficial effect of extracts during cisplatin treatment. Toxic chemicals, certain drugs, infectious agents, etc. can induce damage to the kidney that ultimately leads to the imbalance of electrolyte . In this study, serum sodium level did not alter significantly (only 5% decrease) in the cisplatin-induced nephrotoxic group when compared to the normal group. Serum level of potassium decreased significantly (p < 0.01) in nephrotoxic animal compared to the normal group. Hypokalemia is a common electrolyte abnormality found during cisplatin treatment due to enhanced renal reabsorption capacity observed in response to reduced intestinal absorption of potassium . Urinary excretion of Na+ and K+ increased significantly after treatment with cisplatin, which indicated the abnormality in kidney function. The administration of DIME and DIEE significantly increased the serum potassium concentration and reduced urinary excretion of Na+ and K+ toward normal values in cisplatin-treated animals, which indicates the potentiality of D. indica fruit to overcome electrolyte imbalance. A significant reduction in the activities of Na+/K+-ATPase, ALP, GGTase, and LAP was indicated that the kidney was adversely affected by cisplatin treatment, which may be linked with the oxidative modification of enzymes . ATPases are considered as integral membrane proteins which require phospholipids and thiol groups to preserve their function and structure . Cisplatin induces toxicity by causing the disturbances in the electrolytes homeostasis which ultimately reduced the activity of Na+/K+-ATPase and leading to cell death . Cisplatin is a water-soluble molecule which crosses the plasma membrane and penetrates into the cell. After activation inside the cell, cisplatin causes direct interaction with the isolated C45 loop that is a major part of Na+/K+-ATPase . A significant reduction in the activities of other marker enzymes (ALP, GGTase, and LAP) indicated that the kidney was adversely affected by cisplatin treatment. This alteration due to cisplatin enzymes could be related to the oxidative modification of enzymes through the generation free radicals . Result reviled that marker enzyme activity was restored after administration of methanol and ethyl acetate extracts. Cisplatin has been found to augment oxidative stress by increasing levels of superoxide anion, hydroxyl radical and H2O2 . In our study, cisplatin induction causes a significant decrease in the level of SOD, CAT, GPx, GR, and GSH level, whereas the level of MDA increases in the nephrotoxic animal. Maintenance of redox balance is important for the maintenance of the integrity of the cell. Antioxidant enzymes such as SOD, CAT, GPx, and GR protect the cells against oxidative stress-induced cell damage by converting the reactive species to a non-toxic or less reactive substance [17, 32]. Reduced glutathione (GSH) is a non-enzymatic component that plays an important role in maintaining the cell integrity and considered to play a central role in the antioxidant network. It also detoxifies certain endogenous toxins, including cisplatin, through the production of GSH adducts . Cisplatin-induced nephrotoxicity causes inhibition of protein synthesis and depletion of intracellular GSH and protein-SH level . MDA is an excellent indicator of the degree of lipid peroxidation. Increase in the level of reactive species or depletion of enzymatic and non-enzymatic antioxidant can cause oxidative stress, which in turn induce cell injury . Significant depletion of GSH and increase in MDA level were observed in the cisplatin-induced nephrotoxic group. 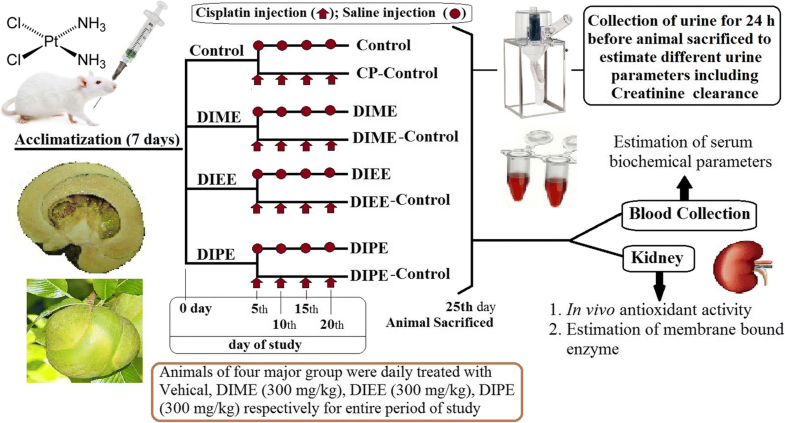 The present study showed that the administration DIME and DIEE in animals that receive also cisplatin significantly increase the activity of antioxidant enzymes. Cisplatin-induced depletion of GSH and enhancement of MDA production in renal tissue also averted by the D. indica fruit extracts. Thus, the antioxidant activity of the extracts may contribute to the protective effect of D. indica fruit on cisplatin-induced nephrotoxicity. In light of biochemical results and antioxidant activity, it was observed that D. indica fruit extracts particularly methanol and ethyl acetate extracts exert a protective effect on the cisplatin-induced renal injury, at least in part, can be due to antioxidant and free radical scavenging activity exerted by the extracts. A number of chemical constituents are isolated from the plant. Previous investigations found the presence of betulinaldehyde, betulinic acid, lupeol, and dillenetin in D. indica bark, fruit, leaf, and stem. Myricetin and isorhamnetin found to be present in fruit and stem. Leaves, fruit, and bark contain cycloartenone and n-hentriacontanol. The fruits also contain rosmarinic acid. The fruits of the plant also considered as a rich source of phenolic compounds [3, 21, 22]. In conclusion, in the light of various biochemical results and antioxidant investigations, the present data confirmed that methanol and ethyl acetate extract of Dillenia indica fruit confers a protective effect against cisplatin-induced nephrotoxicity and other damaging effects. Treatment with methanol extract to a larger extent prevented cisplatin-induced nephrotoxicity by protecting the kidney from damaging and by strengthening antioxidant defense mechanism. Protective effect of D. indica fruit, at least in part, can be due to their antioxidant and free radical scavenging activity. Further study is required to find the molecular mechanism and to isolate bioactive molecule responsible for the nephroprotective activity of D. indica fruit. The authors are thankful to CES College of Pharmacy, Kurnool, and Assam Down Town University, Guwahati and to all the friends, lab colleagues, and the fellows who directly or indirectly helped us during this experiment. No financial support was received from any sources for this work. SS and RC are involved in designing the experiment and the collection of the sample. SS, RC, and PK performed the experimental work and statistical analysis. SS, RC, and PK managed the literature and wrote the first and final draft. All the authors read and approved the final draft. Not applicable as no study on human was performed. Deavall DG, Martin EA, Horner JM, Roberts R. Drug-induced oxidative stress and toxicity. J Toxicol. 2012; https://doi.org/10.1155/2012/645460. Available from: https://www.hindawi.com/journals/jt/2012/645460/cta/. [Accessed 21 May 2015].